Valentine's Day Delivery or Pick up in-store. We're at Schmidt's Gems & Fine Jewelry in Fargo, North Dakota your Diamond and Engagement Destination. Today we're talking about Valentine's Day. Brenda. 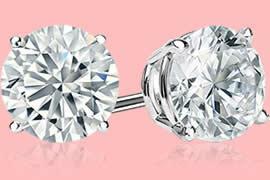 Probably the biggest gift request that we get for Valentine's Day is diamond studs. It's completely universal. It's something as long as her ears are pierced, everyone loves wearing diamond stud earrings. They're versatile. They go with everything. They're easy to wear, and price point driven for those that are buying them. We've got diamond studs set up in 20 points total weight all the way to over two carats total weight, ready to go right out the door for Valentine's this week. When it comes to trading them in, Schmidt's Gems & Fine Jewelry has a dollar-for-dollar trade back policy. What that means is if you already own a pair of diamond studs and you're looking to enhance or upgrade that pair, we will give you a dollar-for-dollar match against a new pair. So you're always going to have a beautiful pair of earrings in her ear ready to go for Valentine's. We are. We're going to try something new in the Fargo-Moorhead area. If you would like your Valentine's Day present delivered to your place of work or even to your home, we will go ahead and do deliveries Monday, Tuesday, and Wednesday. We are going to do the cutoff on Wednesday at about noon just to make sure that we can get everybody's presents delivered on time for Valentine's Day, but we are doing it free of charge. We'll have it gift wrapped and ready to go, as long as you live in the Fargo-Moorhead area. Wonderful. Where are we at, Brenda? Okay, 3011 South 25th right here in South Fargo. Schmidt's Gems & Fine Jewelry.